Last Sunday was one of my proudest moments. 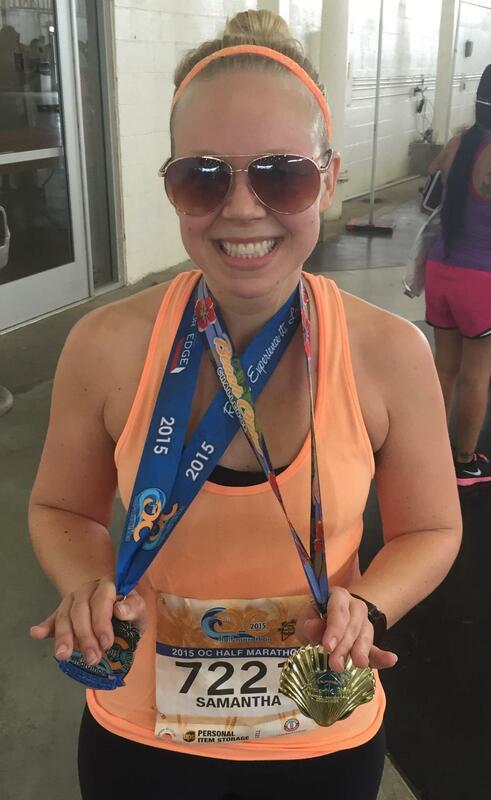 Last October I set out to do my first half marathon in Long Beach, CA. I found out that if you run all 3 Southern California half-marathons consecutively, you can get the Beach Cities Challenge medal. Of course, who doesn’t want an extra 1 pound medal? I made up my mind I was going to get that medal and convince the husband to do it with me. 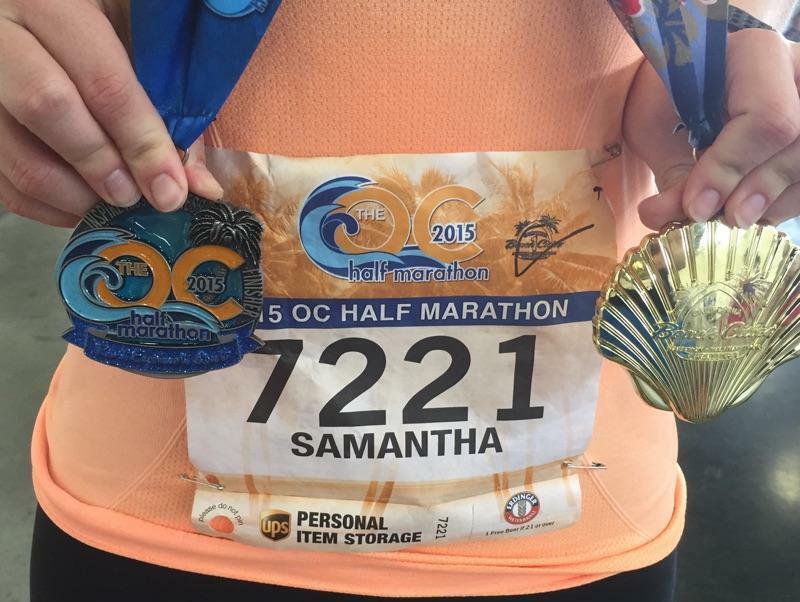 We completed the Long Beach Half in October and Surf City Half in February with the OC Half being the last one to get that medal. Due to the unfortunate back pain I had leading up to the race and it being in the middle of waiting for MRI results, I told myself simply to just finish the race. 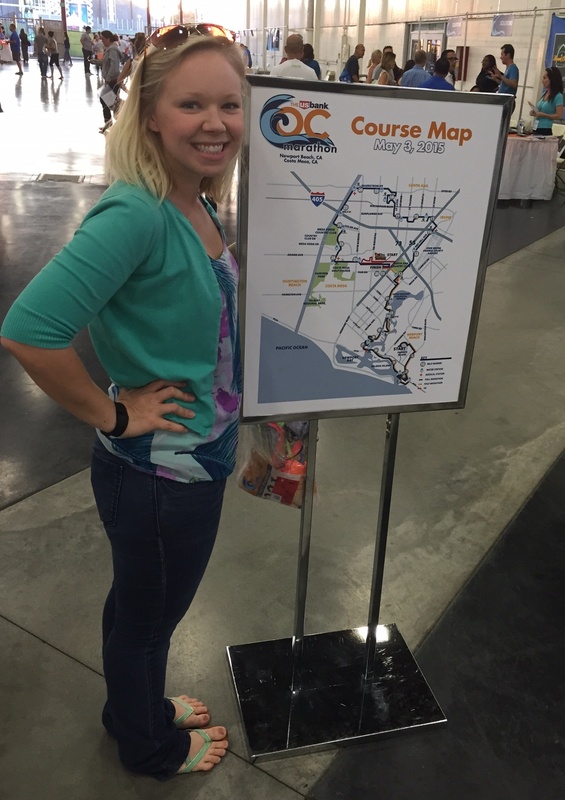 On Friday we attended the expo to pick up at our bibs at the OC Fairgrounds. The expo was very easy to get in, get our bibs and get out. We visited a few booths and of course I picked up a new Bic Band headband to sport the day off. It’s all about matching in those race pictures! Bright and early Sunday morning we drove down to Fashion Island where the race started. This is the first and only race I have done where the start and finish were at different places. The great part about that was we parked and were at the start line within 10 minutes. We knew we would have to figure out getting back but thought we to ask a friend who was at the race or get a shuttle back. The weather was cool and overcast, the perfect racing weather. Average temps stayed in the mid 60s- welcome to joys of racing in California! The race started at 6:15am and our coral got running by 6:30. Again, this was the fastest start we have ever participated in. I hope all races are like this. From the time it took to park and start the race was approximately 25 minutes. Any racer knows it doesn’t get better than that. The course was one of my personal favorites. 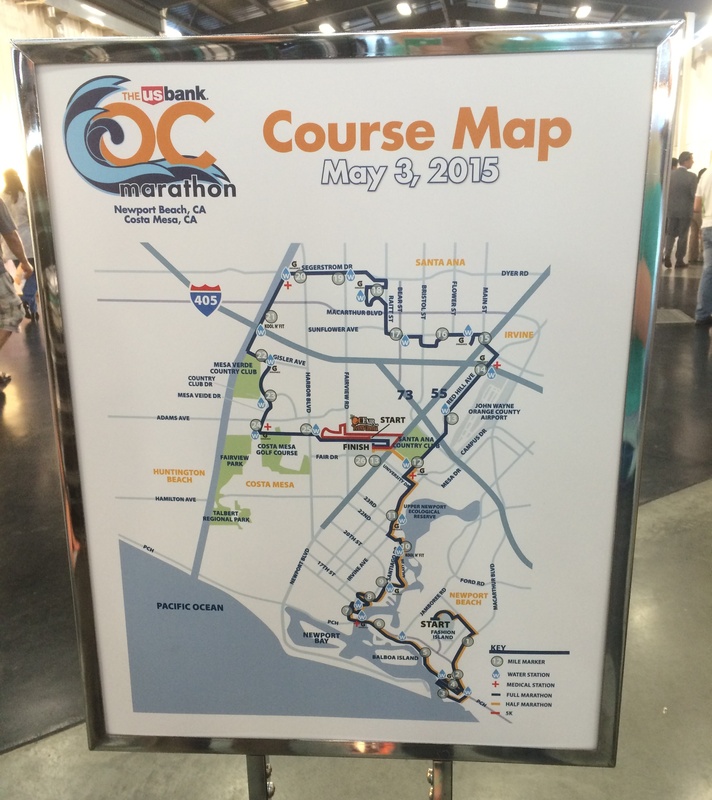 Starting at Fashion Island, the course went to Corona Del Mar beach and through residential areas in Newport Beach. I loved getting a real estate tour imagining how often I would visit the beach if I lived in one of those beach mansions. The entire course was heavily supported with aid stations every 1.5 – 2 miles. The only part of the course I did not like was when the half marathoners and marathoners split off miles 7, there was a very narrow trail that slowed most people down. Once you got past the 1/4 of a miles trail, you were back to open running space. The course consisted of small rolling hills until miles 11 with the largest hill through the race. Leading up to the race I was very intimidated by the hill but after Ragnar, it seemed like a piece of cake. The race finished at the OC Fairgrounds in Newport Beach. 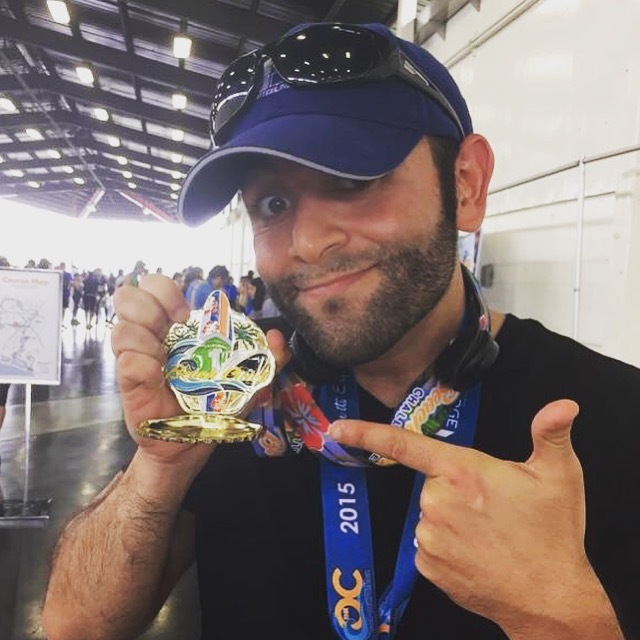 This was my 2nd best time for a half marathon. I paced myself through the race without stopping. Crossing that finish line left me with a smile on my face for not only doing better than I thought I would do but finally completing that challenge. After the finish, we walked through the line, got our snacks and caught our breath. Getting back to our car at the start line required an Uber and a lot of patience to get around the traffic jam of everyone trying to leave. All in all, we were happy with the very easy start to the race and the great course. The medal was beautiful and the t-shirt was one of my favorites which just added to an already great race! So was the 1 pound medal worth it? Hell yes! At this point, I am definitely considering doing it again next year. Needless to say though I am ready for “summer break”. 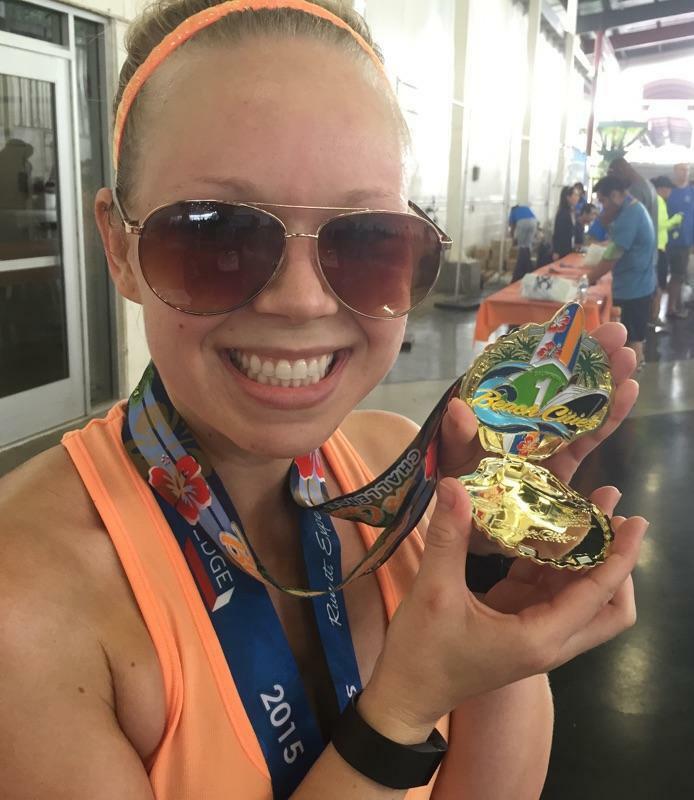 4 half marathons, 1 relay race and a handful of 5Ks in 8 months is why running and I need a little separation. This entry was posted in Fitness, Health, OC Half Marathon, Race, Running, Workout and tagged Fitness, Health, OC Half Marathon, Race, Running, Workout. Bookmark the permalink.